With plucky, sometimes surprising repertoires, harpists from around the world meet at Emory this week for concerts, workshops and classes. Elisabeth Remy Johnson, principal harpist with the Atlanta Symphony Orchestra and an artist affiliate and teacher at Emory, will lead a session on "Gateways to Creativity." Photo by Anne Carr. Think of the harp and it often conjures fairytale images of ethereal music drifting from the heavens — an instrument unfairly stereotyped by weddings and garden parties. 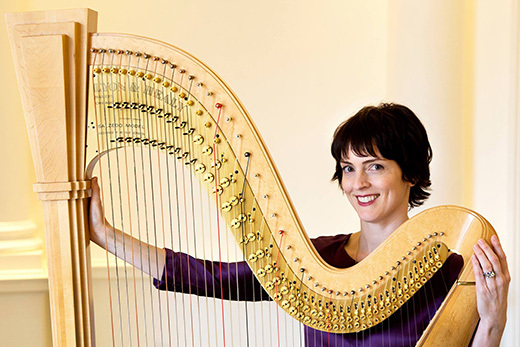 In truth, the modern harp is a versatile instrument that pushes boundaries, straddling all manner of musical genres, from classical and jazz to Celtic and world-beat folk music, says Carolyn Lund Munford, artistic director of the Atlanta Urban Youth Harp Ensemble. This month, the Emory community has a chance to witness that musical dexterity firsthand, when the American Harp Society (AHS) hosts its 42nd national conference at the Emory Conference Center Hotel from June 30 to July 1. This marks the first time the national conference has come to Atlanta, and it’s expected to draw more than 400 harpists and harp enthusiasts from around the globe, says Munford, conference co-chair. Not only will the event bring some of the world’s leading harpists and teachers to town, it will also offer a series of evening concerts that are open to the public and a free Sunday morning concert featuring both seasoned professionals and a youth ensemble comprised of students from around the country. “One of the highlights will definitely be the evening concerts,” she adds. In many ways, bringing the conference to Emory is a natural fit, says Sheila Tschinkel, a visiting Emory economics scholar and a self-described “harp hobbyist” who will be attending the AHS gathering. Emory Symphony Orchestra conductor Richard Prior, Edward Goodwin Scruggs Conducting Chair and a senior lecturer in composition and director of orchestral studies, composed a piece for the Aletheia Duo — AHS president Ann Yeung on harp and Jonathon Keeble on flute — which will have its premiere at the concert on Saturday afternoon. With an emphasis on youth participation, the conference will also showcase the Atlanta Urban Harp Youth Ensemble, a non-profit organization currently teaching 85 students in DeKalb and Fulton counties to play the harp at no cost. The urban youth ensemble was founded in 2000 by Elisabeth Remy Johnson, principal harpist with the Atlanta Symphony Orchestra and an artist affiliate and teacher at Emory, and Roselyn Lewis, a longtime Atlanta public schools music teacher. The goal of the nonprofit organization was to give children experience and exposure to the harp. Under the direction of Munford, the program is now based at Drew Charter School, where it serves more than 80 students between the ages of 9 and 18. “Elisabeth had this dream of making the harp accessible to students who might not otherwise have the opportunity to play the harp, as it can be a really expensive endeavor,” Munford says. International harp sensation Remy van Kesteren performs a solo recital on Saturday, July 2, at 8 p.m. at Glenn Memorial Auditorium. The concert is open to the public; tickets are $25. Photo by Marco Borggreve. The conference will feature master classes, exhibits, performances, workshops and seminars on topics ranging from “Marketing for the Modern Musician” to “The Mysteries of the Harp Repertoire” and “The Psychology of Performing Under Pressure." Thursday, June 30: Spotlight on Youth Concert, 8-9:30 p.m. at the Schwartz Center for Performing Arts. Featuring Bridget Kibbey, Park Stickney, and soprano Indra Thomas performing with the 30-member Honors Ensemble under the direction of Atlanta Symphony Resident Conductor Joseph Young. Tickets are $25 and may be purchased at the Arts at Emory Box Office. Friday, July 1: A Tribute to Susann McDonald, 8-9:30 p.m. at Glenn Memorial United Methodist Church. Harpists Maria Casale, Elizabeth Hainen, Maria-Luisa Rayan, the Aletheia Duo and Naoko Yoshino will honor their teacher Susann McDonald. Tickets are $25 and may be purchased at the door or through Eventbrite. Saturday, July 2: Remy van Kesteren Solo Recital, 8-9:30 p.m. at Glenn Memorial United Methodist Church. 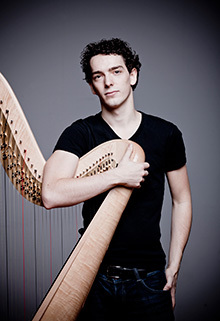 An acclaimed international harp sensation, van Kesteren is the 9th USA International Harp Competition gold medalist and founded the Dutch Harp Festival. Tickets are $25 and may be purchased at the door or through Eventbrite. Sunday, July 3: Combined Youth and Adult Ensemble Concert, 11:30 a.m.-12:30 p.m. at the Silverbell Pavilion of the Emory Conference Center Hotel. This mega-harp event will feature classical and folk tunes, including “Let There Be Peace on Earth” and a swinging version of “Georgia on My Mind.” The concert is free to the public and will be followed by a barbecue lunch, available for $5.